Google got a much-needed win today when Marketo, the marketing automation platform, chose Google Cloud Platform (GCP) to migrate its entire on-prem operation. The partnership will extend beyond hosting with Google also providing deeper integration with GSuite. Google says that should enable Marketo customers to generate content and communicate with customers directly from the Marketo platform using Google tools like Gmail, Sheets and Hangouts Chat. In addition, Marketo plans to use Google BigQuery for advanced analytics and Google’s machine learning APIs with the goal of providing better marketing insights for its customers. The company points out in a blog post announcing the win, that it has relationships with other SaaS vendors including Evernote, which also moved its entire on-prem operation to GCP earlier this year in a massive three-petabyte migration. Just last week, Box announced it was partnering with Google for image recognition using Google’s Cloud Vision service. Google has been playing catch-up in the cloud as it stares up at AWS in first place. Microsoft has taken the bulk of the remainder of the market share, while Google remains far behind. Despite being born in the cloud, and running a massive cloud operation, it took Google quite a long time to start taking Infrastructure as a Service seriously. It really began making a concerted push when it hired Diane Greene to run GCP at the end of 2015, more than 9 years after Amazon launched AWS. Since then, the company has been trying to position itself as the more developer-friendly open platform and attempting to attract more enterprise customers. 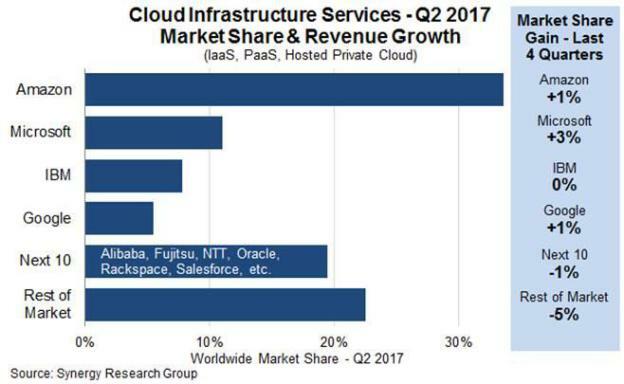 As Greene pointed out in an interview last year, in spite of the fact the cloud has been around for over a decade, it’s still early days, and there is still plenty of marketshare to be had. She’s not wrong about that. In an interview last year at the University of Washington, AWS CEO Andy Jassy admitted he was surprised it took so long for the competition to catch on, but now that it has, Jassy said he sees room for more than one winner. Google certainly hopes so, and it needs all of the wins it can get this point, as it tries to catch up with the competition. Landing Marketo certainly helps.